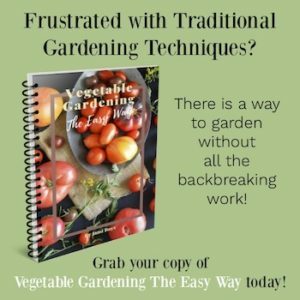 Tried and true tools for gardening – both vegetable beds and flower beds, as well as general garden chores. 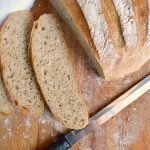 Some are basic items everyone should have, some will make your gardening life easier – and a few may even surprise you. After many years under my gardening belt, I’ve discovered a thing or two about tools for gardening. There are things you need – and shouldn’t cheap out on – and there are things that are just fun to have, but not really essential. 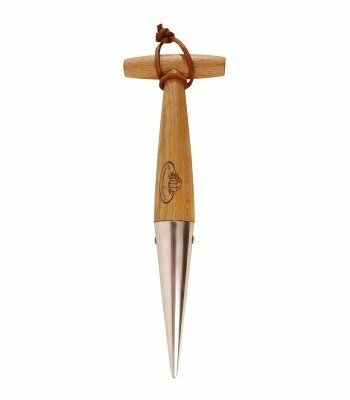 There are also things that may not be a traditional garden tool, but that will definitely make your gardening life easier. 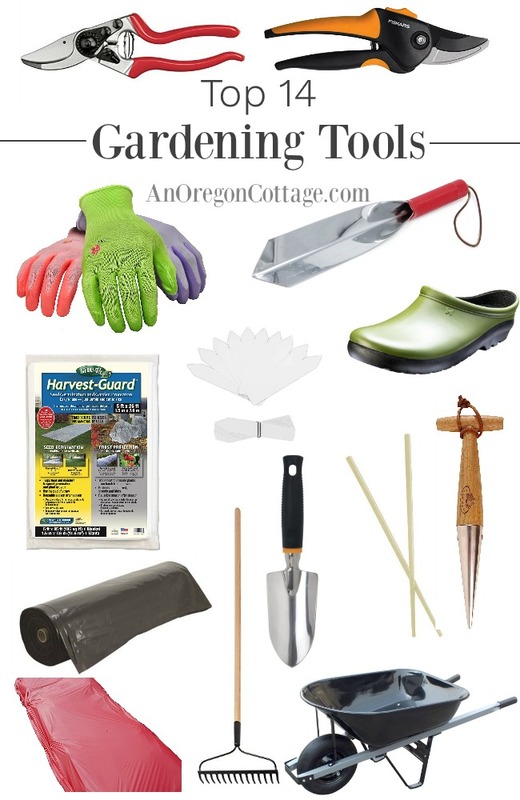 So I thought I’d list my favorite, must-have ‘tools’ – a term used rather loosely, since I’m including things like shoes – that I use for gardening. Hopefully this will help you if you’re new to gardening or inspire you to try something new if you’ve been gardening awhile (chopsticks, anyone?). The tools I’m recommending are both normal tools we think of for gardening (but I tell you why a certain type is the best…) and a bit unusual. My only rule in compiling this list was that the tool had to be something I use every season – and sometimes all season long. 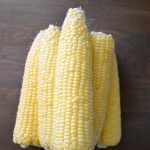 Note: This list is for general gardening – if you’re into starting your own seeds (and you should! ), you can see how I start and care for seeds here with basic, inexpensive materials and a simple shop light set-up. Also, you can go here if you’re looking for tips for starting or maintaining an easy care garden. 1. 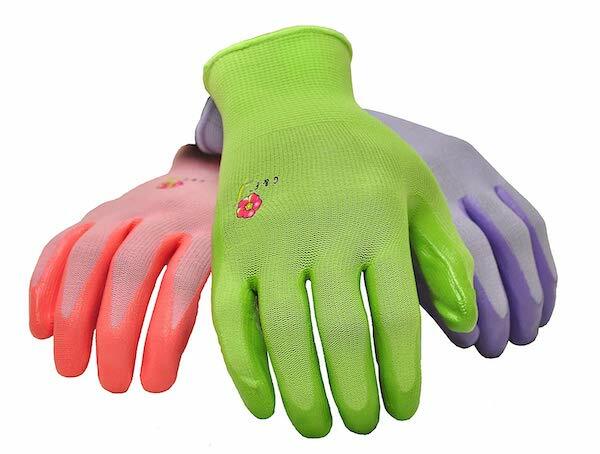 Nitrile Garden Gloves. I am not a bare handed gardener, which I know some prefer (getting their hands in the dirt and all that…). Whenever I have thought I could just plant a few things gloveless, I was rewarded with days of trying to get tiny, yet irritating splinters out of my hands from the compost I use in our beds. Not worth it. Plus – manure. Just saying. I use these type of gloves and this pack of 6 will usually see me through a couple of seasons – with enough extras for helpers, which we definitely want to encourage, right? 2. Trowel(s). I’ve used this heavy duty trowel from Fiskars for years and it’s still going strong (pictured on the left). 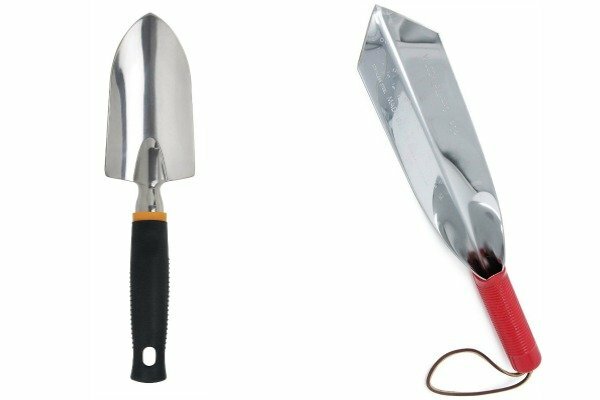 I’ve got the Wilcox All Pro 102S 12″ Digging Trowel (pictured right) in my cart on Amazon right now – I think it will be great for the extra rocky soil we have now. What you DON’T want are those cheap colored metal trowels or a trowel with a thin metal neck that attaches the handle to the trowel head. Both of these bend and break easily – many times within days of using it. Ask me how I know. 3. Shovel. Of course, right? There’s almost nothing you can do in your yard without a shovel. 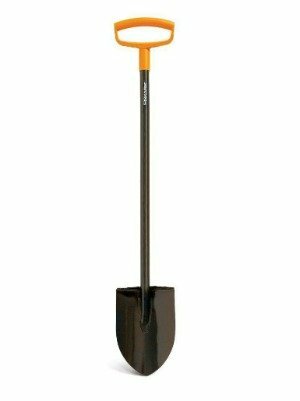 We have a wooden handled shovel and have had a fiberglass shovel (supposedly lifetime guaranteed, but we managed to break it…), but we didn’t realize what we were missing until we got a Fiskars Steel D-Handle Digging Shovel last year. Apparently all shovels are not created equal. This is so sturdy – the blade doesn’t bend at all and we’re not afraid of breaking the handle. I didn’t think I’d care about the handle, but I find it makes digging easier. Brian now fights me for this, preferring it over our other shovels. 4. Metal garden rake. This is what I use for spreading compost over newspapers in the flower beds and spreading it in the vegetable garden’s no-till raised beds. 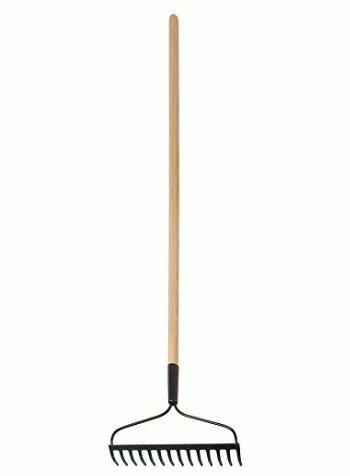 You need a sturdy rake for these jobs – not to mention just pushing dirt around – and a metal rake like this will get it done. 5. Wheelbarrow. 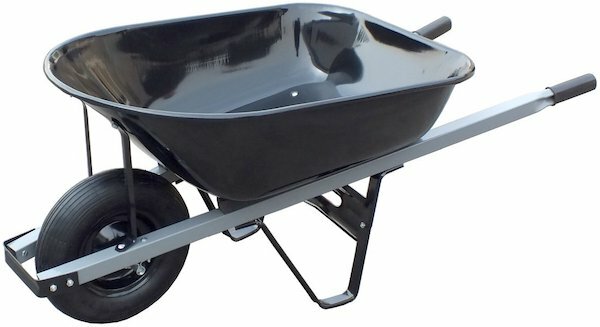 Everyone who has a yard needs a wheelbarrow. Get one that has a metal bed at least 6 cubit feet with sturdy attachments to the handles like the one pictured and you won’t be sorry. You’ll need it for carrying all the soil and compost to your raised beds and flower borders. 6. 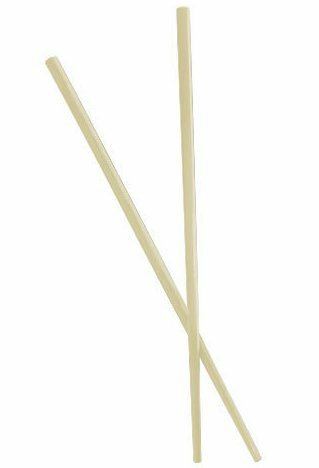 Plastic Chopsticks. Um, really? Yep – I haven’t found anything better to make holes for seeds, lightly cover them, and then help to transplant the growing seedlings when starting plants – indoors or out. I’ve been through lots of wooden types, but the plastic sticks last the longest, which I guess is not surprising. 7. Old cheap steak knives. If you would’ve told me years ago that an old steak knife would be on my favorite tools list I would’ve laughed. But I keep one in my garden bag, by my seed starts, and in two places out in the garden. It cuts through soil to help me transplant small seedlings, cuts twine for vertical gardening, and helps me harvest everything from lettuce heads to broccoli. Mine have cracked handles and rust spots – don’t throw out your old knives, repurpose them! 8. Bypass pruner(s). Well, of course – things need to be pruned and cut – a lot. After years of buying cheaper brands and not having them even last a season I splurged and bought a Felco bypass pruner (left above). And it did last – even though I left it to rust once for weeks out in our spring rain. I thought it was a goner, but we bought a new blade, cleaned and oiled it and … no, it’s not as good as new, but it works and I still use it. 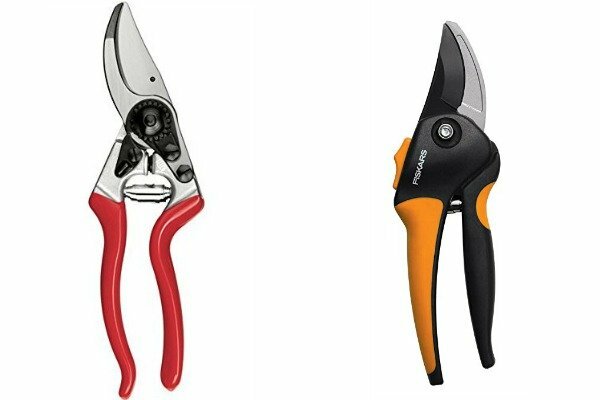 But I now also use a less expensive pair I got that actually does last longer than a season – Fiskars Softgrip pruners (right above). 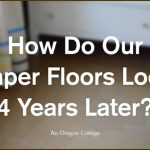 They are comfortable, work well, and I really like the easy-to-find lock button (the one thing that bugs me about the Felcos…). Related: How to Prune with Confidence. 9. Floating Row Cover. I cover lettuce seedlings in early spring so they don’t drown, broccoli almost all season so I don’t lose it to the aphids, and spinach in the fall to keep it growing as long as possible. I even give my tomatoes a head start by making crazy tomato covers with it – and they love it. 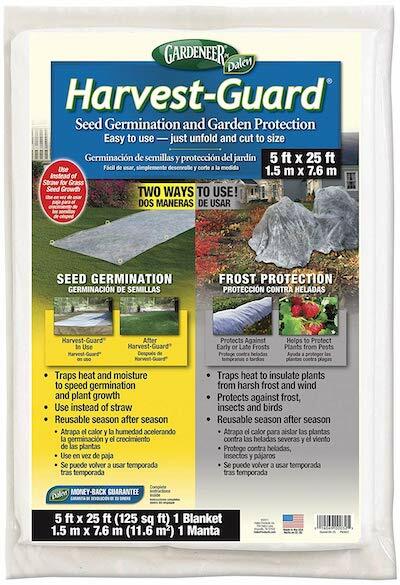 It’s like this stuff, but I almost always buy it by the foot from Pinetree Garden Seeds (search “floating row cover”). 10. Red Plastic Mulch & Black Plastic Mulch. I’ve used red plastic mulch underneath all my tomatoes and peppers after reading that studies showed a 20%+ improvement in fruiting. 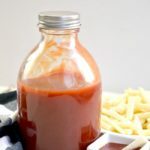 It also helps regulate the soil moisture (go here to see how to grow tomatoes that will thrive). I use thick, 6 mil. black plastic to inhibit weeds, to kill early spring weeds before prepping the beds for planting, and sometimes as a mulch around plants like peppers to help regulate moisture. Pinetree Garden Seeds also sells red plastic mulch by the foot (tip: using this referral link – or the one above – gets a $5/$25 coupon emailed to you!). 11. Dibber. I thought I wouldn’t really use this quintessential English gardening tool, but when I found one on sale I bought it. And wouldn’t you know, I use it a lot. It’s the best for quickly making rows in raised beds for small seeds like carrots and lettuce and makes perfectly sized planting holes for small transplants and bulbs. 12. 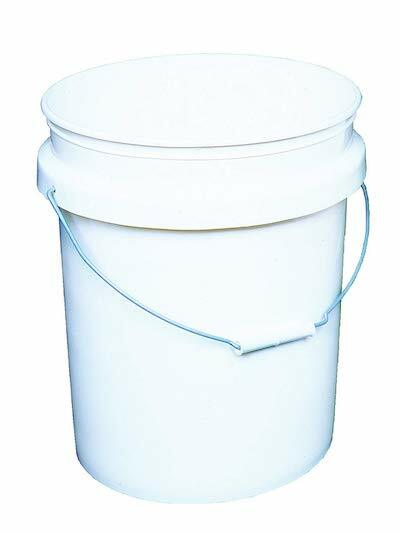 5-gallon buckets. These are in use all.the.time. Every time I think we have too many and we can get rid of some, that’s when the apple harvest comes, the beds need weeded, the onions need curing, or a million other things. And sometimes I just want to use one as a garden stool – when you’re in the thick of some garden chore, you use whatever’s available. 13. Garden clogs. I’m not sure this qualifies as a “garden tool” but it’s sure something I use daily – in the garden – so I’m going with it. 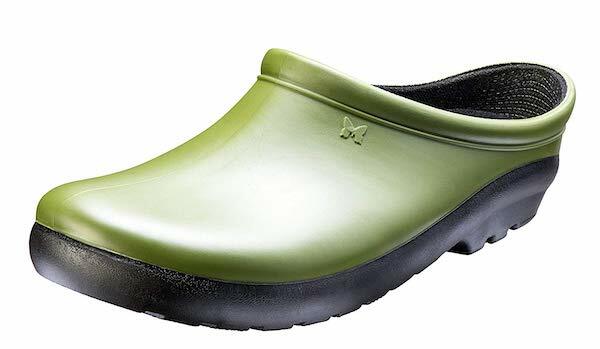 I have basic Sloggers clogs like the one pictured – they are SO much better than the tennis shoes I started gardening with because they can get wet and it doesn’t matter. Plus going in and out of the house to harvest and do chores is easier when you can just slip them off and on. 14. 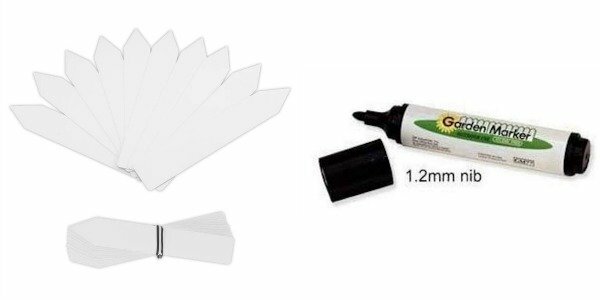 Plastic plant markers and Garden Marking Pen. I’ve tried wood plant markers, homemade ones from milk jugs, metal markers, and “pretty” ones, and the only type that lasts more than a season are basic, white, plastic plant markers. Nothing fancy, just some like the ones pictured above. As for writing on them, I’m here to testify that Sharpie permanent markers aren’t always that permanent (unless it’s on your wall or your white slipcover, of course…). Sharpies won’t last a season outdoors and when you go to harvest, you won’t be able to see the variety anymore. Garden marker pens usually do a better job of it. I’m buying this one to test how it holds up after my last marker finally faded. 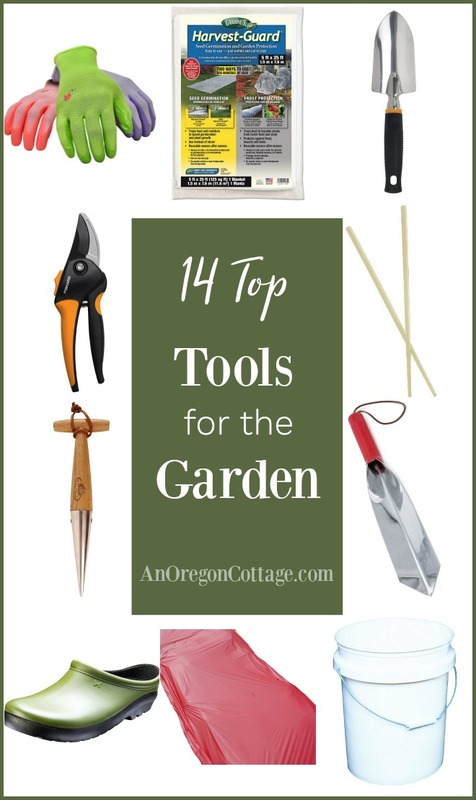 So these are the tools I use most often in the garden and consider essential. We have others, of course – you can’t garden for any length of time without gathering garden tools! I have things like a portable garden tool bag that my sister gave me one year that goes with me everywhere and holds all the small tools mentioned above. But honestly, it’s not essential – I gardened for many years carrying tools in a bucket or old basket. So now it’s your turn: what are some tools for gardening – or anything, really – that you couldn’t imagine gardening without? This article has been updated – it was originally published February 2013. I forgot to mention that one of my favorite garden essentials are trugs. I use them all the time to put weeds in and also for gathering veggies and flowers. I have all different sizes and don’t know how I could garden without them!!! How do you sharpen the blades on your pruners? Leather gloves, trowel, 3 time hand cultivator,wagon (can be pulled by hand or the riding lawn mower), scissors,plastic plant markers, grease pencil, metal bowl from kitchen for harvest. I go barefooted in 22 ft by 35 ft lg garden. The rest of my gardens are 13 square foot gardens that are 4 x 4 and containers all over the place. Looks like we share a lot of the same tools – and I didn’t mention a wagon, but I appropriated my kids radio flyer years ago! 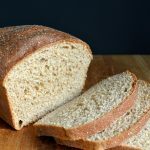 thanks for your list – perfect timing! We are starting our seeds looking forward to getting into the garden soon. 5 gallon buckets – oh yeah!!! we have a stack at the entrance to the garden. I’m thinking I’ll be using gloves more, and I really want a pair of those clogs. Maybe this summer. 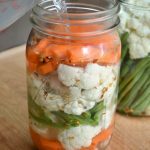 You’ve motivated me to get focused on the upcoming garden season – thank you! Good gloves- I am always looking for my next pair, and a long screwdriver. I have a 9 inch screwdriver with tape at the 6 inch mark. Utah is the second dryest state in the nation and its my test to see if there is enough water in the soil. If it goes in easyish to the tape we are good for a cople of days. I also use it for general poking and diging and pointing. Oh, man, that’s a super idea Mirinda! So excited to have the Garden Party back next week! I’m so very excited for next Tuesday’s Garden party – its been a long winter. I use almost all of these items also. We bought a soil block maker last year and I love it, although my husband says it’s more of a toy than a tool. Oh, I’ve thought about the soil block tool/toy – it does sound fun! i love beautiful gardens and I dream of one day living in the country where i could have one myself. But I have learned that my thumb really isn’t so green! Really it’s just that I’m too lazy to do the work that needs to be done to make it successful! LOL! If you were my next door neighbor I’d be begging you to trade your garden produce for something I could sew up! 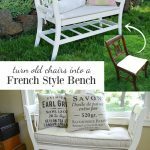 Great list to get you started this spring! I would love to have you share this on The HomeAcre Hop this Thursday! I also co-host a hop called Wildcrafting Wednesday for herbal remedies, natural living, real food recipes, and self sufficient living. I use kitchen shears for many of the same purposes you use that old steak knife…harvesting squash, aregula (well anything that can’t just be plucked with fingers), cutting things which aren’t thick enough for pruners. And I thought I was the only one with an old serrated knife kept in the garden! Couldn’t pick squash without it, since we like crookneck squash. We also use plastic 5-gallon buckets to water our squash, drilling a small hole in the side of the bucket about an inch from the bottom. Then fill the bucket with the water hose, and walk away! 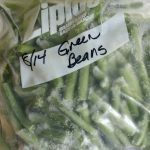 Looking forward to the Garden Party–already have some sugar snap peas peeking out of the ground. I have 2 old serrated ginsu knives in my garden. Great for dividing perennials as well!